Single point mooring (SPM), also known as single buoy mooring (SBM), is a floating jetty/buoy that is anchored offshore to allow liquid cargo handling such as products of petroleum for tanker ships. Single buoy mooring is mostly used in places where dedicated facilities for unloading or loading liquid cargo isn’t available. They are often positioned at a distance of a few kilometres from the shore-facility (one of the facilities that’s located onshore and used for receiving ships as well as transferring cargo plus people to them). It is easy to handle large quality of cargo. Ships that have high drafts can be easily moored. Does not need ships to go to the port, and therefore, save time and fuel. The capability of handling extra large vessels. How Does Single Buoy Mooring Work? The loading buoy that is anchored offshore is typically divided into different parts, which have dedicated functionality. Anchoring and mooring system, product transfer system, as well as buoy body are the main parts found on the single buoy mooring. The single buoy mooring is basically moored to the seabed by means of a mooring arrangement, which includes chain stoppers, anchor chains as well as anchors. The mooring arrangement allows the buoy to be capable of moving freely within defined limits, taking the tanker ship conditions, current, waves as well as wind into consideration. The buoy is moored to the bottom of the ocean using anchor chains (legs) joined to the anchor point (piled or gravity base) on the seabed (bottom of the ocean). Chain stoppers are normally used to join each chain to the buoy. Also, the part of the SBM System (buoy body) that’s floating comes with a rotating part connecting to the tanker. These rotating parts enable the tanker to become stable at its desired place around the buoy. Usually, the tanker is moored to the buoy using a hawser arrangement consisting of polyester or nylon ropes that are shacked to a hook that has been integrated on the buoy deck. To prevent any damage from tanker fairlead, the chafe chains are attached at the hawser tanker end. The mooring systems that are used for offshore operations of this kind follow the standards that OCIMF (Companies International Marine Forum) has put forth. The Companies International Marine Forum is an association of oil companies that have an interest in the shipment as well as terminalling of crude oil plus oil products. Positioned at the centre of the mooring buoy, the product transfer system transfers products from the PLEM (Pipeline End and Manifold) (geostatic location) situated on the seabed and takes them to the tanker. Flexible horses called risers join the pipelines beneath the surface of the sea to the product transfer system of the buoy. The configuration of the risers varies depending on buoy motions, sea condition, water depth and so on. The buoy is attached to the tankers by means of floating hose strings provided with breakaway couplings (which is a special coupling type that has a breakpoint that breaks at a break load that’s predetermined, activating intervals valves that’ll close automatically at both ends, preventing further product release) to prevent oil spills. 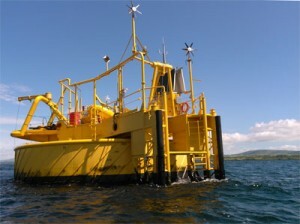 SBM systems often use a swivel system that connects the PLEM (Pipeline End and Manifold) to the buoy. Product swivel system provides movement flexibility to the tankers at the time of transfer of the products. That movable pipe-connection system helps in preventing premature hose failure as a result of traction or bending stresses. First, the tanker is anchored to the buoy for unloading or loading of cargo. Fenders are used for protecting the buoy from the ship’s unexpected movement as a result of bad weather. A boat landing space that is on the buoy deck has a purpose of providing access to the buoy to set up the connections as well as secure the ship. Handling as well as lifting equipment on the buoy permits handling of hoses connections plus safety tools. After the connection have been made, valves are then operated from an electrical substation (part of an electrical generation and transmission as well as distribution system). As a safety precaution, necessary navigational aids and alarm systems are provided. Liquid cargo is transferred from PLEM (Pipeline End and Manifold) (or geostatic location) to the tanker by means of product transfer system of SBM system. You should ensure that MBC’s (Marine Breakaway Couplings) are used to prevent possible oil spills. The Gall Thomson MBC has become the world-wide industry standard for offshore marine terminal applications. SMOG sets out guidelines for single buoy mooring terminal operators, and it provides a framework as well as a set of procedures based on the vast experience of various companies. It mainly deals with the 2 most common types of single buoy mooring, which are the Catenary Anchor Leg Mooring (CALM) and the Single Anchor Leg Mooring (SAM). What is a Conventional Buoy Mooring?